The need for Student Housing quality standards? Following the recent award of BD’s Carbuncle Cup to the UCL Student Housing development on Caledonian Road in London, the architectural press have created somewhat of a storm around the quality of student housing and design standards. Personally I think the media are ten years too late for all this. I believe that in general the design quality of purpose built student housing has improved significantly from early generation developments. There are many reasons for this, not least of which the need for new developments to continually offer more than any existing student housing within a locale. I spoke at a conference back in May about this – you can see my talk by clicking here. Above: Early 1st Generation purpose built student accommodation. There is a continual debate about what contemporary student needs are and how that is designed into purpose built accommodation. Investors and developers remain attracted to student housing, but land values and capital build costs necessitate a relatively fine balance in terms of ensuring schemes are viable – and more importantly; fundable. The rental price point and ensuring maximum occupancy demand are clearly key factors as students pay upwards of £4500 per year for their ‘digs’. Ultimately students who decide to occupy these buildings are essentially endorsing them by choosing to live there and pay rent. Therefore how relevant is any third party criticism of what others’ think’ is right or wrong? To give this subject some wider context it is worth noting that the growth of student housing has been fuelled by a shift away from extremely poor quality student housing within HMO’s owned by single Landlords. This sort of accommodation has gained a reputation for shopping trolleys in gardens, damp/ cold homes, within student ghetto’s where transient population issues lead to social problems with owner-occupied homes. 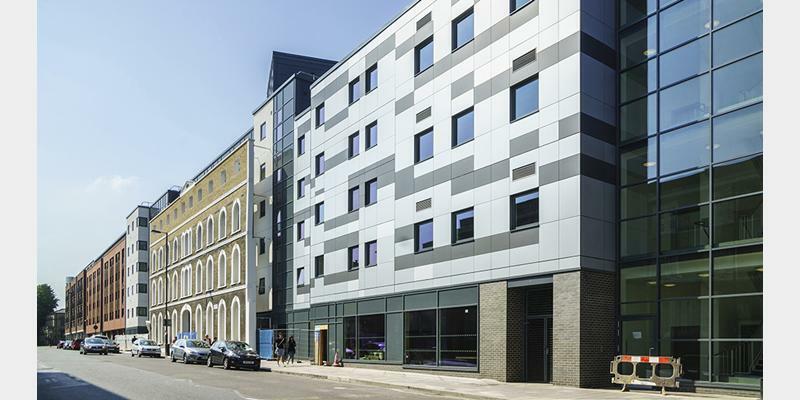 Purpose built student housing is a positive and necessary asset class. Students need to live somewhere and the UK higher education system is amongst the best in the world, delivering many economic benefits. The Government have recently recognised the need to gain a better understanding of this asset class by forming a British Property Federation group, led by Unite MD Richard Simpson, to advise/ support Government on a wide range of policy matters affecting Students and their housing. You can find out more here. This was following the ‘perfect storm’ of 2012 where the sector felt a hit by the £9k fees hike, immigration laws changing and A-level scoring levels being adjusted. I know a number of people who sit on this group and I receive regular BPF communications on current issues being discussed. One point of contention in the media this week is the size of bedrooms and more specifically their window sizes. On the Caledonian Road development a comparison has been made with a local prison and a suggestion that prisoners get better quality living accommodation than students. A fundamental difference is of course that students can get out when they want – and they choose and pay to live there! A student bedroom generally serves 2-3 uses; desk based working, sleeping, relaxing (TV, gaming, social media, internet etc). This is fairly consistent with a domestic bedroom within a home. From my experience student bedroom window sizes are broadly in-line, if not better, than modern domestic homes. There are other factors which come into play when comparing purpose built student housing to domestic properties. Student housing buildings are intensely cellular in their floor layout planning. This is largely unavoidable and issues with security, fire separation and heating/ cooling these spaces are always an issue. Almost all doors must normally be closed preventing natural ventilation occurring. Bedroom windows are typically restricted in their opening due to a number of operational concerns with taller buildings. These issues directly influence the practical size of windows. Students also have an increasing range of on-site alternative spaces for daytime occupation. These include shared Kitchen/ Living rooms, common rooms, external amenity spaces, coffee lounges, gyms etc. 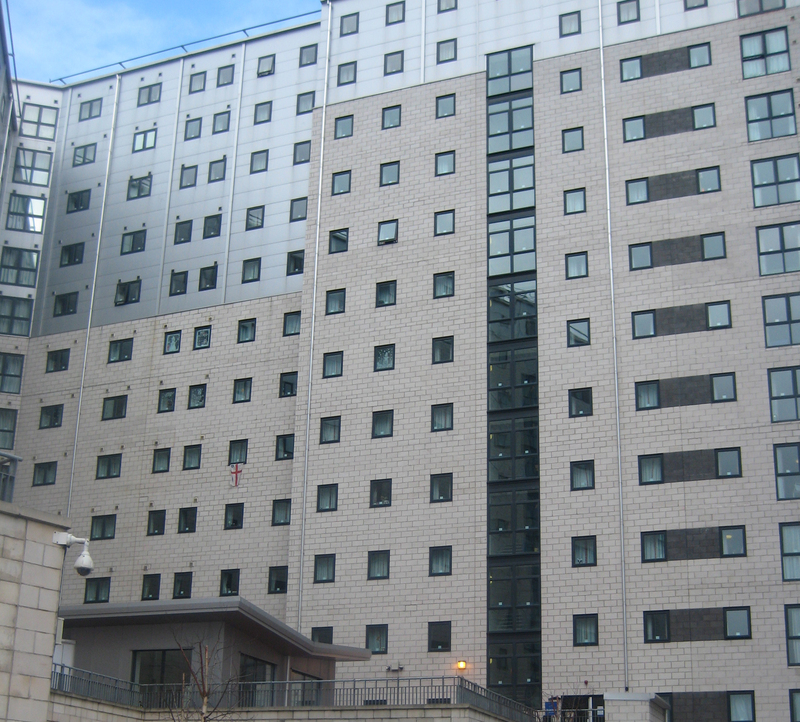 I think there are valid points to be made about the need for new student housing to be built of a suitable quality, both internally and externally. But I think this current media hype needs to be considered in a broader perspective. It seems to me that people are jumping on a band wagon here, with little actual knowledge or understanding of these buildings and how they operate. There will always be exceptions, as with all building types, which stand out for criticism. It is inevitable that student housing would feature highly this year when you consider how strong this sector is whilst other remain slow/ dormant! But this should not open the flood gates for complete sector wide reviews and suggestions of regulatory policies being required. 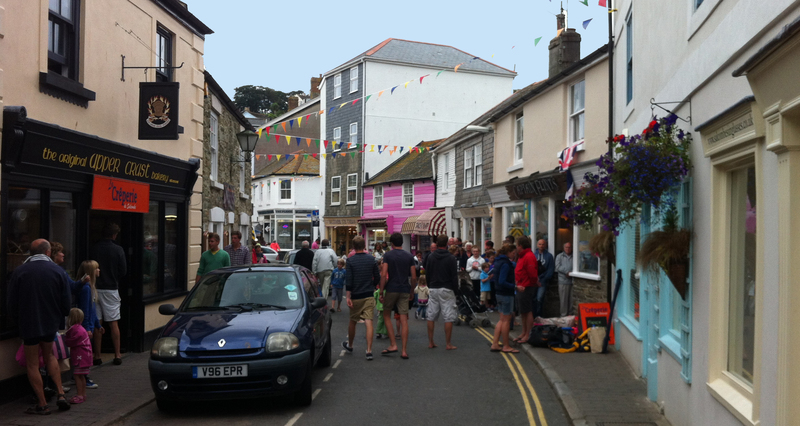 Summer in Salcombe and the High street lives on! Sorry the blog has been so quiet recently. The last few months have been extremely busy at work and I have just moved house too! Thankfully we have just returned rested from our summer holiday. Every year we head down to Salcombe in South Devon. Salcombe is a small town of around permanent 1000 inhabitants. For such a small place, I’m always surprised how many people I speak to seem to know about Salcombe. Its main economy is tourism and fishing (especially shellfish). The former taking the majority. In summer, Salcombe can see around 10,000 people holidaying in a small number of hotels and large number of holiday houses/ cottages/ apartments; a mix of second homes and rental properties. Salcombe’s property market is said to be the second highest outside of London. Sandbanks, near Poole being the No. 1 location. Wherever you look in the media we are told that ‘the High street is dead’ – well not in Salcombe (in the summer at least). Going back to why I like Salcombe; the high street is a real treat. There is no Costa Coffee or Tesco’s here (or anywhere nearby!). If you want bread, you go to the Bakery (which also turns into a Creperie at night), Meat is supplied by the Butchers, Coffee can bought from several local suppliers such as Salcombe Coffee Company. Ice-cream is in plentiful supply – from the Salcombe Dairy. There’s an amazing, bright pink (! ), old fashioned sweet shop called Cranch’s. There are a number of excellent Deli’s, at least five great pubs and an amazing selection of restaurants – all good quality. There is also a wide range of clothing retailers, including the first and original Jack Wills store (49 now exist across the UK). Life here is good. Expensive perhaps, but matched by quality. I suspect the national retailers have been resisted by the Local Authority, but I may be wrong. I wonder if the usual suspects could survive here? Is this place such a niche? Being in this town you can see and sense the ‘community spirit’. People know each other and seem to work together. The lack of big name retailers and plentiful Independent Retailers seems to give the place unique character, identity and ownership. I appreciate this is largely because its a small town and larger urban centres are more complex socially and economically, but I, like many others, think we should encourage a better mix of Independents in our towns and cities elsewhere. One example I can think of where you do get a sense of this is St. Pancras station in London – a very different context. Salcombe is a beautiful and enjoyable place to be. Especially in the Summer. I do however appreciate there is another side; The locals have a long and quiet winter to survive. Their reliance on tourism is seasonal and some businesses practically shut down in the winter. Add property prices in Salcombe which continue to rise and are in huge demand. This means its very difficult to even find property here – let alone be able to afford to buy it. This must be a major challenge for the local people to continue to live here, especially first-time buyers/ younger generations. There have been a small number of affordable developments around Salcombe in recent years. I wonder at what point the ‘community’ might start to diminish? No doubt it already has compared with its previous years. This year is a little different for us, although not for me. Next to our apartment is a building site. 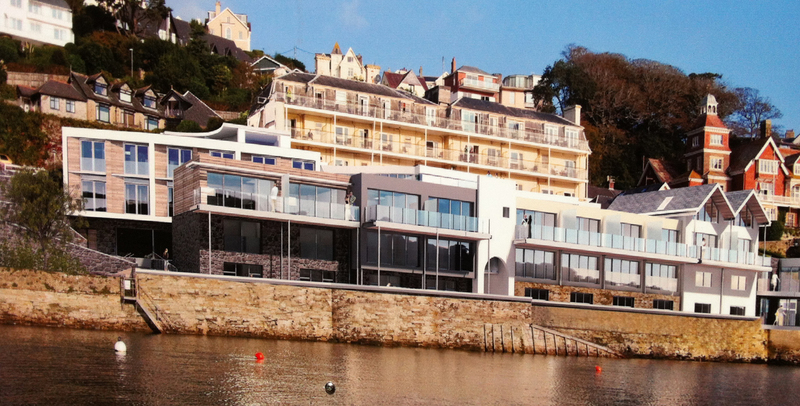 Harbour Hotels with Galliford Try are redeveloping the Salcombe Harbour hotel. They are downsizing and upgrading the hotel offer in terms of rooms and building 14 new residential properties on the waterfront. The scheme is called Estura and houses range from £1.4m to £2.4m – no affordable housing here! This project, or others like it, have been in the pipeline for many years on this site. Its good to see something actually happening in one respect. Salcombe has a great high street and a thriving local economy, from May to October at least. Its a small place, but punches above its weight, defined by a unique and characterful economic and built-form fabric. This gives it a clear identity which I have no doubt is key to its success and attractiveness.